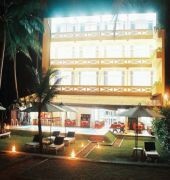 Hotel Garden Beach is a beachfront property situated in Kosgoda (12 km/20 minute drive from Bentota), just within a five minute walk to the Kosgoda Railway Station. 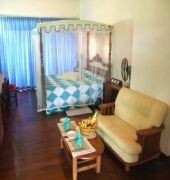 Accommodations feature air conditioning, mini bar, refrigerator, television, hair dryer and marble bathroom with shower. Every room has a balcony with a view of the ocean. 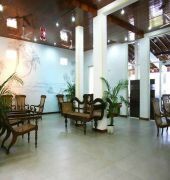 Guests can enjoy dining at the open-air beach deck restaurants that serves seafood in addition to Sri Lankan specialties. 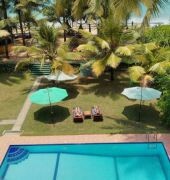 The hotel features an outdoor swimming pool, a garden with sun loungers where guests can enjoy the view of the sunset and an Ayurvedic centre offering a range of wellness treatments as well as meditation sessions. Water sports activities are also possible at the beach such as diving and surfing. 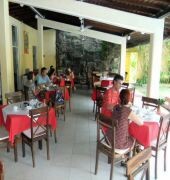 Excursions and nature adventure can be arranged by the Hotel Garden Beach. The Bandaranaike International Airport is 116 km away or approximately 120 minute journey.